This is a sweet little sour cream container that we made at a recent workshop. Just in time for Christmas! Pop a few wrapped chocolates inside and it’s a perfect gift for friends at work! I used the Ski Slope DSP to make the container. We stamped the circle “Joy” stamp from Spotlight on Christmas in Baja Breeze ink. We punched out the “Joy” with the 1-1/4″ circle punch. Then layered it with Baja Breeze card stock punched out with the 1-3/8″ circle punch. 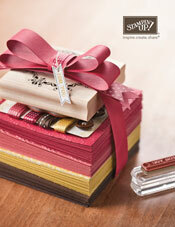 The final circles were layered on red card stock punched out with the Scallop circle punch. The “Joy” was then tied on with white taffeta ribbon and silver cord (retired). This is the third layout for my step-Nan’s 90th album. I loved putting this layout together because each page has a theme based on the photo. The spotty page is all spotty theme because all the ladies in the photo have spotty dresses on. And the second theme is obvious, because there is snow in the photo! For the spotty theme, I used Parisian Breeze DSP for the base page, as well as for the thick Baja Breeze strip. I’ve stamped the heart from Priceless and cut it out and stuck it above “DJs”. The “DJs” was stamped from Defining Alphabet and cut out and layered over squares punched from Stampin’ Up!’s square punches. The ladies in the photo love to shop at David Jones … hence, the “DJs”. There is a strip of Baja Breeze 1″ wide grosgrain across the page and the stamped “R” is from Defining Alphabet, which has the definition for “Remember” next to it, stamped from Life Definitions (also known as Define Your Life). The base for this layout is from Ski Slope DSP. The “SNOW” has been stamped from Lovely Letters Alphabet and then cut out and layered over punched out squares from Stampin’ Up!’s square punches. Again, the stamped “F” is from Defining Alphabet, which has the definition for “Favourite” next to it, stamped from Life Definitions. My next scrapbook layout for my step-Nan’s 90th album was entirely inspired by the Spring Mini Catalogue. Page 4, to be precise. Of course, the scrapbook page in the Spring Mini is 6 x 6 and mine is 12 x 12, so there are differences! I’ve used textured card stock – Baja Breeze and Basic Grey – as my base colours. I’ve then punched a thin strip of Basic Grey Textured card stock with my Eyelet Border punch, layered it with a wider strip of Walk in the Park DSP and then embellished with 1″ Baja Breeze striped grosgrain ribbon. A little bit of white tafetta ribbon is tied to the Baja Breeze ribbon. The inside of each layout was stamped in Basic Grey with the flower from Friends 24-7. I stamped and cut out the butterfly from the stamp set Great Friend in Baja Breeze and So Saffron. I also stamped and cut out the frame from Great Friend. The oval punch images came from the Summer Love Rub Ons, available in the Spring Mini. Finally, corduroy buttons finished off each page. The fourth and last challenge was a sketch challenge. We were to use the sketch below for inspiration to create our own card or scrapbook page. The only criteria – it needed to be predominantly pink! This was the card I made. I’ve used the stamp set Cheers to You and the Level 2 hostess set Occasions for All. The paper is Regal Rose DSP from the Level 1 hostess Patterns Pack and Bella Rose DSP. The card base is Pretty in Pink. The third challenge was to create an adorable watering can. We followed a step by step tutorial on how to make the watering can including the template on SplitCoastStampers here. Of course our watering can had to be pink! This is my watering can, I used Pocket Silhouettes and the jumbo wheel Friendly Words. My colours were Pretty in Pink and Pink Passion. I’ve embellished it with flowers from the Pretties Kit (coloured in with my Pretty in Pink marker pen) and also exchanged the top handle from paper to striped grosgrain ribbon. A couple of rhinestone brads add bling! The second challenge was a colour challenge. We had to create a card, scrapbook page or 3D project using Pink, Black and White. We could choose any pink. This is the card I created using Pink Pirouette. I also used the stamp set Together Forever – it’s one of my favourites! On the weekend, my fabulous up-upline ran a Girls’ Night In Cyberstamp to help raise money for Breast Cancer Reasearch. Jayne runs cyberstamps for her team members every month, but this event was opened up to anyone who wanted to participate, anywhere in the world! Plus, Jayne hosted the event at her home as well for guests to attend. What a super effort by Jayne, in my opinion. Well done! You can check out the results of her fundraising efforts here. And you can see Jayne’s blog here. Plus, you can see all the other entries here. I used the stamp sets Friends 24-7 and A Rose is a Rose. The pinks are Pink Pirouette, Regal Rose and Rose Red. Click on the image for my demo website. Find out about current promotions, workshops and lots more! Click on the picture to see exciting new products! All content is the sole responsibility of Rachel Capps, Independent Stampin' Up!® Demonstrator and the use of, and content of the classes, services, or products offered on this website are not endorsed by Stampin' Up! All stamps, paper and inks used are copyright of Stampin' Up!®1990-2009, unless otherwise stated. All images, designs and words are copyright of Rachel Capps, unless otherwise stated. Please respect my time spent creating and only replicate my designs for personal use. I love Pinterest! Do you?